Read an updated article on how to stream Internet TV into your home easily and at low cost. Today, there are various ways to stream movies, shows, news, radio, and other entertainment on your television using a high-speed Internet connection. Roku, Boxee, and Apple TV are examples of services that provide access to this online streaming content, referred to as “over-the-top” (OTT). For example, you can hook up a Roku device to your TV and get access to Netflix, Hulu, Amazon Instant Video, and other news, sports, entertainment, and religious channels. Now, Roku offers the Mormon Channel, where you’ll find LDS content such as Mormon messages, Church films, general conference, firesides, radio series, and more. For example, you can watch the new Joseph Smith movie, which is only available through the Mormon Channel. Although the Mormon Channel has been available for years on the Internet (learn more), you can now watch its content on the television in your living room. Learn more about the Mormon Channel on Roku. I was pretty excited about this, but I cannot find the channel anywhere. It’s not on the roku site and it’s not available via the new channels ‘channel.’ Anybody have any pointers? Nathan, the channel is located in the Channel Store on the Roku Box under “Religion & Spirituality”. It is also the 2nd rated channel in the “Top Rated” section in the Roku Channel Store on the Box. They are still working on getting us on the web site. I hope that happens soon but the channel should be easy enough to find on the box. Is there/will there be a Mormon Channel/BYU-TV streaming on the Apple TV? If not, I may invest in a Roku Box. Eric, you can get Church podcasts on the Apple TV including Mormon Messages put its not organized into a channel like we have on the Roku. Love the Mormon channel on Roku, but more often than not lately it won’t connect due to ” boowser” Problems. We do not ha e problems with other channels. Any ideas out there? Has the Mormon Channel been added to Net Gear’s Neo TV streamer? 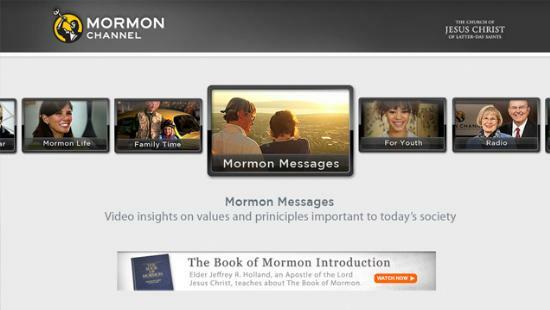 There are no current plans to add the Mormon Channel to Net Gear’s Neo TV streamer. Any future plans to get an Apple TV channel going like Roku has? Lots of Wards are getting Apple TV for Airplay, it would be nice to have the channel to use too! There are no immediate plans to create an Apple TV channel, but it is being studied. I am wanting to download the audio only of the April 2017 General Conference in Russian for a Russian family who want to hear it in their own language. Go to https://www.lds.org/general-conference?lang=rus to download the audio. You can it for individual talks by going to each talk and clicking the download button (the down arrow inside the circle). Or you can download an entire session by clicking the three dots to the right of the heading for each session.